New Delhi: Bharat Forge has been adjudged as one of Daimler AG’s top global suppliers for the year 2016. 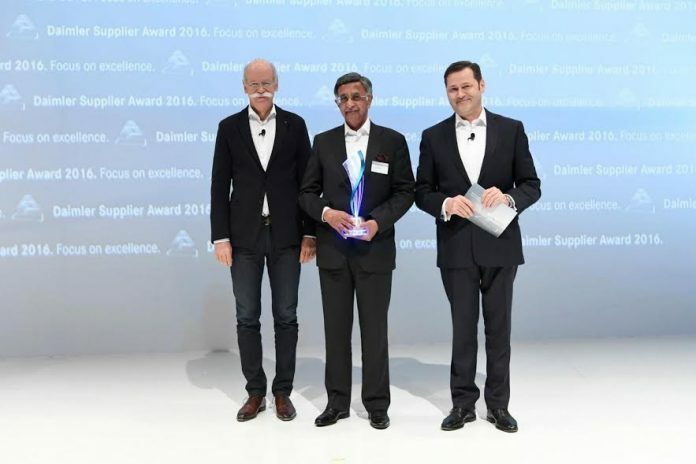 Bharat Forge was awarded Daimler Supplier Award 2016 – Global Procurement Trucks and Buses for the international supply of best quality crankshafts and front axle beams. Baba N. Kalyani, Chairman & Managing Director, Bharat Forge received the award at the hands of Dr. Dieter Zetsche, Chairman of the Board of Management Daimler AG, Head of Mercedes-Benz Cars, and Dr. Marcus Schoenenberg, Vice President Procurement Daimler Trucks and Buses on February 23, 2017 in the Mercedes-Benz Center Stuttgart. Once a year, the vehicle manufacturer headquartered in Germany presents the Daimler Supplier Award for above-average performance and partnership collaboration with its suppliers. Performance is measured in terms of quality, costs, delivery reliability, and innovation power. Furthermore, co-operative and moral behaviour is also evaluated.